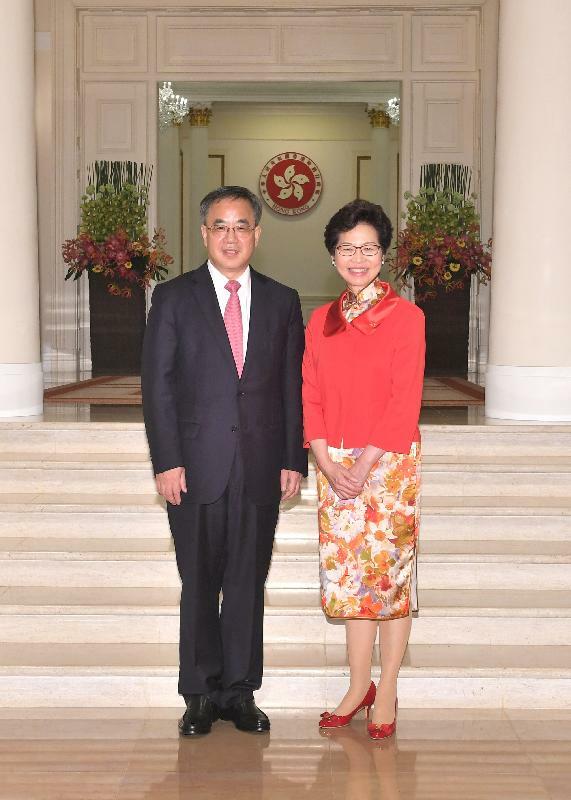 The Chief Executive, Mrs Carrie Lam, met the Secretary of the CPC Guangdong Provincial Committee, Mr Hu Chunhua, at Government House this evening (July 1). The Governor of Guangdong Province, Mr Ma Xingrui, and the Secretary of the CPC Shenzhen Municipal Committee, Mr Wang Weizhong, also attended the meeting. Mrs Lam pointed out that the Framework Agreement on Deepening Guangdong-Hong Kong-Macao Cooperation in the Development of the Bay Area signed this morning had set a clear direction for the joint development of the Guangdong-Hong Kong-Macao Bay Area and signified a milestone in the work on the development plan for the Bay Area. She said that Hong Kong would leverage its unique positioning as set out in the Dedicated Chapter on Hong Kong and Macao of the Outline of the National 13th Five-Year Plan, with a view to developing and "going global" with other cities in the Bay Area in a co-ordinated manner to complement the country's Belt and Road Initiative through acting as a two-way open platform. Noting that Hong Kong and Guangdong have established close ties in various areas, Mrs Lam hoped that the two places would strengthen co-operation and seize the enormous opportunities from the development of the Bay Area for mutual benefit.